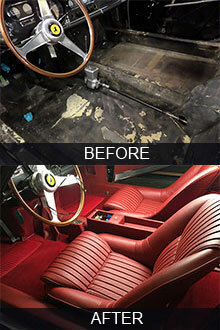 Car Classic Interiors is a Los Angeles auto upholstery restoration shop. My name is Rafael 'Rafi' Abramyan. 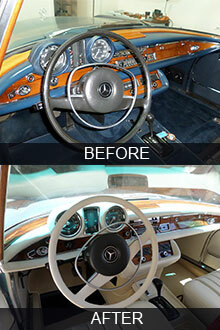 Since 1992, I have restored hundreds of classic luxury and exotic European sports car interiors. My auto upholstery services include the reupholstery of car seats, dashboards (dash fascias), steering wheels, consoles, convertible tops, headliners, carpets, door panels, and trunk panels. I have earned a nationwide reputation as a gifted auto upholsterer that has the credentials and auto upholstery portfolio to deliver a "show car winner" with a "factory new" interior restoration. 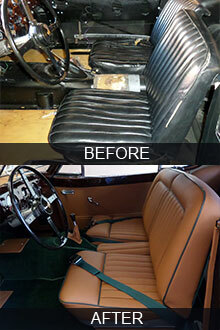 All of my car interior upholstery projects are customized to meet your exact needs. For over 25 years I have delivered superior "hands on" results to please classic car collectors from Hollywood to Wall Street and abroad. My principles of Originality, Passion, and Convenience for my discriminating clients have served me well in the auto upholstery business. The majority of my auto upholstery work is Jaguar restoration, but I have restored many other European makes and models, most notably classic Ferraris. At Greystone Mansion's 3rd annual Concourse de'Elegance in Beverly Hills, one of my customers, Simon Rubin, exhibited his 1952 Jaguar XK120 Coupe. Working with Jon Pollock Restorations, I had just recently completed a full interior restoration on this beautiful classic Jaguar. 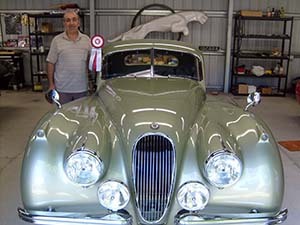 Both Jon and I were thrilled to learn Simon won a "Best of Show" award for his XK120 Coupe. To view a picture gallery illustrating this Jaguar car restoration in Los Angeles from the beginning to end, click here.